Harder than most comparable alloys. Easier to finish than most comparable alloys. Capable of fabrication with cervical collar. Inside of coping capable of being sandblasted to produce natural matte shade. Elite II is a high noble, outstanding quality, yellow premium alloy for metal-bonded-to-porcelain restorations. Containing 88% gold, 9.5% platinum and no palladium, Elite II exhibits superior physical and mechanical characteristics. Its custom-developed composition permits easy polishing to a lustrous finish. The deep yellow color makes Elite II ideal for cases where metal occlusal surfaces are prescribed. A durable alternative to palladium alloys , Auribond-GP is a high strength, high noble metal premium ceramic alloy. Its 86.5% Gold content affords Auribond-GP a pleasant light gold color, resulting in outstanding procelain shade control. Polishing characteristics are superior to most other high gold content ceramic alloys. Precise fit, excellent bond to porcelain and exceptional workability make Auribond-GP the ideal choice for long-span bridges and single units. When nothing but the best will do…count on Auribond-GP. Aurident is proud to present Summit, our newest high noble ceramic alloy. Compatible with most leading porcelains, Summit is a reasonable alternative to high Palladium alloys. Its 74.2% Gold content gives Summit an attractive light yellow appearance. Climb to a higher level of quality and affordability… come up to Aurident’s Summit! 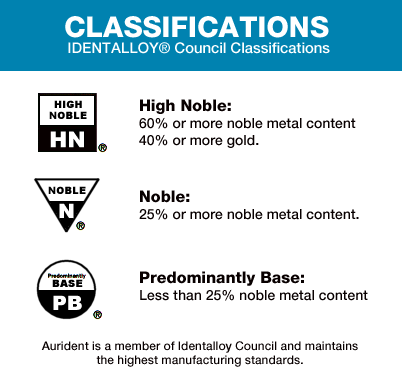 Aurident’s attractive new High Noble alternative to palladium alloys. Auritex-66 has a lighter oxide than comparable alloys and is compatible with most porcelain systems on the market. The exceptionally high yield strength of Auritex-66 permits fabrication of long span bridges or single units with extremely fine marginal integrity. Auritex-WP is an outstanding high noble white gold ceramic alloy, with over 20 years of proven reliability. Containing 62.2% gold, and 23.4% palladium, Auritex-WP has become an attractive alternative to high palladium alloys. The relatively low modulus of elasticity of Auritex-WP permits its use with porcelains having an extensive range of thermal expansion coefficients. Excellent mechanical properties, marginal integrity and dimensional stability allow it to be used for long span bridges with confidence! Over a decade of proven reliability! Auritex-XP is a high quality, Silver-free, Gold-based ceramic alloy formulated for true shade and color control in gold bonded to porcelain restorations. Compatible with most porcelains, its high strength makes Auritex-XP ideal for high stress applications such as long span bridges and implant cases. Auritex-XP easily polishes to a high luster. Make the switch now to “hassle-free” Auritex-XP, the alloy of choice for technicians nationwide. Auritex-HP is a High Noble alloy designed for use with a wide spectrum of sensitive porcelains. The relatively low modulus of elasticity of Auritex-HP permits its use with porcelains having an extensive range of thermal expansion coefficients. A low silver content minimizes the probability of greening while a light oxide layer permits excellent porcelain shade control. Auritex-HP’s ease of workability insures high-quality results at an economical cost. Focus, from Aurident, offers an economical Noble metal PFM solution to the high market prices for today’s precious metals. Lighter oxide than many alloys for better shade control. More units per ounce due to low density, making it very cost-effective compared to other precious metal alloys. Compatible with most leading porcelains. Low Silver content minimizes porcelain greening. May be used with some press-to-metal porcelains. With almost a decade of proven reliability behind it, VISION has become a favorite of technicians nationwide. VISION is a Palladium-based, Silver-free alloy designed for porcelain fused to metal restorations. The addition of Iridium, a scarce noble metallic element of the Platinum group, insures exceedingly fine grain structure. High yield strength at elevated temperatures makes VISION resistant to margin creep. VISION is compatible with most porcelain systems. 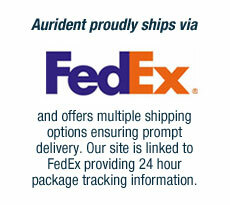 Set Your Sights On Iridium Grain Refined VISION From Aurident! High-strength Noble metal alloy for PFM restorations. Cost-effective alternative to gold-based alloys. Ideal for long span bridges. Easy to cast and finish. Compatible with most porcelain systems. Esthetics comparable to all ceramic restorations. Low-cost all precious metal alloy. Auritex-ZP… Aurident’s Economical Alternative to Gold Alloys. Aurident’s Auritex-ZP is a Noble Palladium-Silver Alloy for metal bonded to porcelain restorations. Auritex-ZP is compatible with high expansion porcelains. Auritex-ZP’s low specific gravity results in a greater number of units per ounce. A Palladium-Silver Alloy for metal bonded to porcelain restorations.